Developing green and facile synthesis techniques for biomaterials has been widely advocated recently. In this study, we report a green and facile approach to prepare pineapple peel cellulose/magnetic diatomite hydrogels in an environmentally benign ionic liquid, 1-butyl-3-methylimidazolium chloride. The structure, swelling and methylene blue (MB) adsorption of the prepared hydrogels were investigated. The results of FTIR, XRD and SEM confirmed the successful embedment and dispersion of m-DE in hydrogel networks. The TG results indicated the improvement of thermal stability due to the presence of m-DE. The VSM results showed the superparamagnetic nature of the prepared hydrogels endowed by m-DE. Moreover, an appropriate addition of m-DE could enhance the swelling ability and MB adsorption capacity of the hydrogels. The MB adsorption process was fast (reaching equilibrium in 30 min) and fitted well with pseudo-second-order kinetic model and Langmuir isotherm model. The maximum adsorption capacity calculated from Langmuir isotherm model was 101.94 mg/g, obviously higher than the hydrogel prepared without m-DE addition (75.87 mg/g). Furthermore, the prepared hydrogels exhibited a good stability and reusability for MB adsorption. 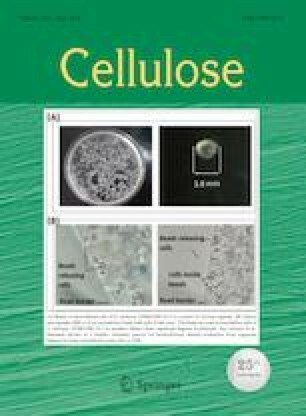 This work presents an alternative for the green construction and enhanced performance of cellulose-based hydrogels. This work was supported by National Natural Science Foundation of China (Nos. 31471673, 31271978), National Key R&D Program of China (No. 2016YFD0400200), and Fundamental Research Funds for the Central Universities (No. swu118066).